Strabane Ógra Shinn Féin Remember Bobby Sands! 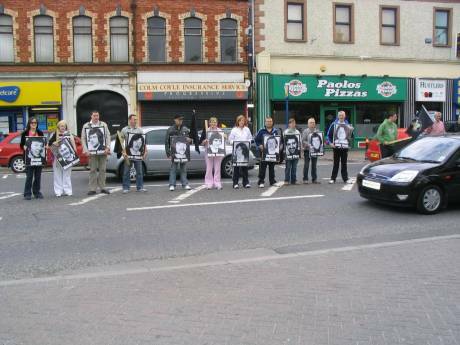 Ógra Shinn Fein in Strabane held a white line vigil in the town centre on Saturday 6th May. The vigil was part of a weekend of events organised across the country to commemorate the 25th anniversary of the death of bobby sands on Hunger-Strike in 1981. Ógra Remember Bobby with pride! Spokesperson for Ogra Shinn Fein, Sean Mac Giolla Easpaig commended the good attendance at the vigil and called on the people of Strabane especially the youth to get involved in similar events planned for the year to commemorate this hugely significant anniversary. North Antrim Ógra Shinn Féin Remember Bobby Sands MP! The 25th Anniversary of the death on Hunger strike of brave Irish soldier Bobby Sands was marked in Ballycastle, North Antrim with a whole weekend of events. Friday evening saw tribute paid to our Comrade through speech, poetry and song. North Antrim Ógra contributed to proceedings with a passionate and emotional reading of "I Fought A Monster Today", a poem written by Bobby Sands and very fitting for the occasion. The Antrim Arms in Ballycastle was then packed to capacity for a very successful panel discussion as the crowds made their way from the vigil in the nearby Diamond. There was a variety of subjects discussed, including the importance of Bobby’s election to Westminster to republicanism; the role of women in the prison struggle; the torture that was inflicted on the prisoners as well as a detailed insight into what kind of people the hunger-strikers were themselves. The panel included ex-hunger strikers, blanketmen and comrades of the brave men who gave their lives in the search of Irish freedom on the Hunger Strikes. Saturday and Sunday saw huge crowds, over 8000 in total coming through the doors of the Antrim Arms once again to see the Hunger Strike Exhibition. A Minor Hurling tournament was played over the weekend with the winners, appropriately Kevin Lynch's of Dungiven, being presented with a one off Tyrone Cyrstal copy of the Laim McCarthy cup, engraved with the H25 logo. On Sunday a huge commemorative parade took place through the town with many young people involved in both the organisation and roll out of the event. 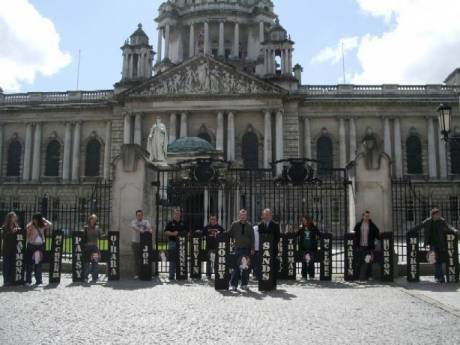 North Antrim Ógra members carried pictures of the Hunger Strikers and also took part in a re-enactment of blanketmen in a prison cell, which had been specially set up in the centre of the town for the purpose. 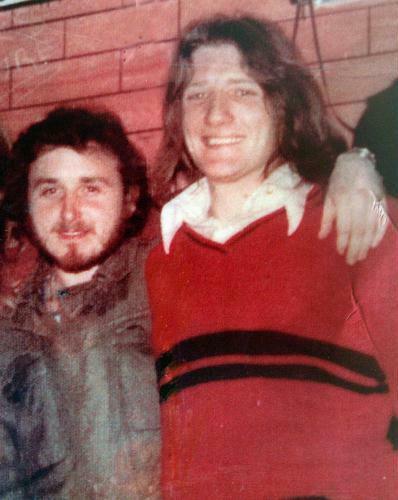 A spokesperson for North Antrim Ógra said, "Many young people arrived in Ballycastle on Friday evening and were asking the question, Who was Bobby Sands? By the end of the weekend it was more than clear that the educational value of the weekends events had not only answered that initial query, but had also deepened within young people in Ballycastle and North Antrim a sense of appreciation and pride for all those who have given their lives and made sacrafices in the persuit of our ultimate goal of freedom for Ireland. This was evident in the interest shown by young people in the role of Ógra Shinn Féin and the increase in membership over the weekend in the area". Ógra activist Brian O'Neill speaks to the commemoration! 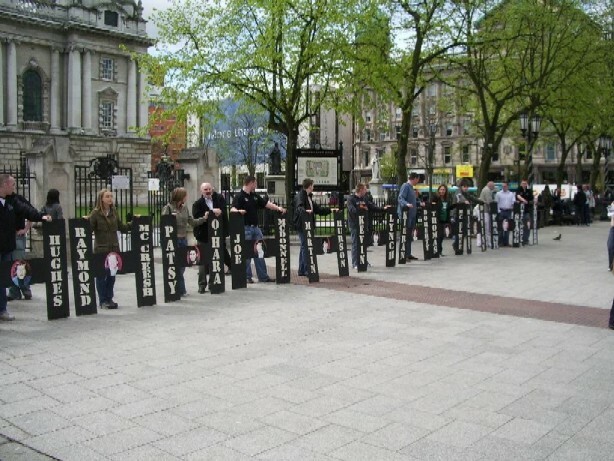 Ógra activists re enact a mock Long Kesh Cell! Belfast Youth Proudly Remember Bobby Sands! In memory of the 12! We remember with pride and honour! This implies that the Sands family's disagreement with the Provos is based on opposition to "peace". It seems to me that it is based on the view that prisoners didn't starve themselves to death for a principle in order that ex-comrades of theirs would be bought by British salaries to rubber stamp the UK government's budget cuts and privatisation. in memory of the 12???? One of the Ógra's photos above is subtitled "in memory of the 12". Have they forgotten already how many hunger strikers died? Sounds par for the course for a movement which is cynically using the hunger strike for a few votes to a rubber stamp assembly whichg can be cancelled at any time by a Brtish ministerial order. Or are they mixing them up with the 12 apostles? 22 men between 1917 and 1981 . At the RSF Hunger-Strike Commemoration which was held in Dublin's O' Connell Street on Saturday last (May 6th) it was repeatedly stated by four different speakers that the Commemoration was being held in memory of the 22 Irish men that died on hunger-strike between 1917 and 1981 . Michael Gaughan & Frank Stagg are included when Republicans talk about the 12 Hunger Strikers. Do as the young Ógra Shinn Féin have done and EDUCATE yourself on your history. Keep up the good work Ógra! Will Sinn Fein Be Showing ThIs Photo? Two 'included' , ten excluded - why ? Do as the young Ógra Shinn Féin have done and EDUCATE yourself on your history. Keep up the good work Ógra! " Why were ten Irish hunger-strikers excluded ? You mention 12 , but ignore the fact that there are twenty-two hunger strikers . Why ? Do YOU know your history ? We commemorate the 12 Hunger Strikers from the most recent phase of struggle for Irish freedom and independence, we do not however forget the others who have gone before in the same fateful and heroic manner. Not one of the commemorations I was at left those other brave soldiers of Ireland out of the event. Respect was paid to ALL of our patriot dead, regardless of how they met their death and also to the brave men and women who continue to struggle for Irish freedom.
" Respect " for so-called 'dissidents' ?
" We commemorate the 12 Hunger Strikers from the most recent phase of struggle for Irish freedom and independence, we do not however forget the others who have gone before in the same fateful and heroic manner. " Except , apparently , when writing-up reports on the hunger-strikers . Untill , that is , you are prodded into 'remembering' .
" Not one of the commemorations I was at left those other brave soldiers of Ireland out of the event. Respect was paid to ALL of our patriot dead, regardless of how they met their death and also to the brave men and women who continue to struggle for Irish freedom. " Your parent organisation (PSF) have denounced those who continue the struggle as 'unrepresentative dissidents' . You dis-agree ? How is this for 'talk' , Paul ?
" Republicans are prepared to work an Executive . We are really prepared to administer British rule in Ireland for the foreseeable future . The very principle of partition is accepted . " - Francis Molloy , PSF leadership , March 1999 [in a newspaper interview] . Paul wrote - " You only have an opinion that was created by British Military Intelligence to divide the undefeated movement of Sinn Féin." Is that the same British Military Intelligence that Denis Donaldson worked for ? You are a trust-worthy foot-soldier for political careerists , Paul . You , too , may get a salary and pension to ease your conscience . West Tyrone Ógra Shinn Féin held a vigil in memory of Bobby Sands on Friday 5th May, who died 25 years ago in Long Kesh on that day. Shortly before 3:30pm members of Ógra Shinn Fein gathered at Omagh College to hold their vigil. Their vigil coincided with the visit of British direct rule minister Lord Rooker to the college. A number of PSNI members were present for the vigil and monitored its proceedings closely. The vigil also coincided with the departure of several thousand pupils from a number of schools in Omagh town. Thousands of pupils descended into the Ulsterbus depot opposite the college and many were intrigued of the nature of the vigil. The vigil came to an end shortly after 4:15pm. As two members of Ógra were returning to the Sinn Féin office, where a public showing of the film H3 was to be held they were told that they would ‘be got’ by two uniformed members of the PSNI. Speaking following the vigil Barry McNally of west Tyrone Ógra Shinn Féin condemned the threats “it is totally unacceptable that members of Ógra Shinn Féin are threatened by members of the PSNI, who are apparently our new police service (sic) this vindicates Sinn Féins policy on policing. Don't bother trying to brow beat me about political history kiddos. I was one of the people carrying Michael Gaughan's coffin at his funeral, and I also read some of his last letters, so there's nothing you pretend republicans can tell me about it. This is the first time I heard of him and Frank Stagg being included as part of "12" anything. There were years separating those hunger strikers from the ones in Long Kesh and there was no direct connection between them, especially as you argue that they do not belong to the some type of special group, separate from republican hunger strikers at other times. Therefore, the only reason for choosing the mystical "12" is an obvious use of religious imagery to get a few more votes for the what the provos openly say is working the system and making it work. The hunger strikers would puke at the sight of you. You reckon that any of them would respond to the treatment they were getting by pleading to be allowed make the system work? Catch yourself on. "Positive action " towards what , exactly ?
" by Positive Provisional action vs Negative RSF stagnancy! - Ógra Shinn Féin "
"Positive action" towards implementing British policy in Ireland , as stated (above) by Mr. Molloy . de Valera and the Stickies are now your yardsticks . For shame . the truth is on the wall...or the window in this case. it's taken some 20 years to do it, but more and more are waking up to the fraud that is Provo "Sinn Fein"
"Strabane Ógra Shinn Féin Remember Bobby Sands!" If they HONOURED Bobby, Ógra Shinn Féin would break from their parent organisation which disgraces his memory and all for which he stood. How wrong can you be , Frankie ? 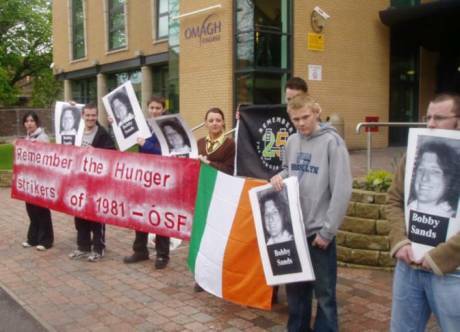 The hunger-strikers themselves were 'dissidents' : do you also seek to dismiss them ? Terence McSwiney , from Cork , died on hunger-strike on October 25 , 1920 . However , he was the third man out of the twenty-two to die in that manner : Thomas Ashe , from Kerry , died on hunger-strike on September 25 , 1917 (Michael Fitzgerald , from Cork , died on October 17 1920) . In attempting to promote 'provisionalism' , your incorrect posts expose it further for the fraud it is . By wheeling and dealing in Leinster House and Stormont ? By stating a willingness to "implement British policy in Ireland" ? 'Respect' is a seven-letter word . As is 'sellout' . The hunger-strikers themselves criticised those whom they believed were attempting to sellout republicanism . That is good enough for me . 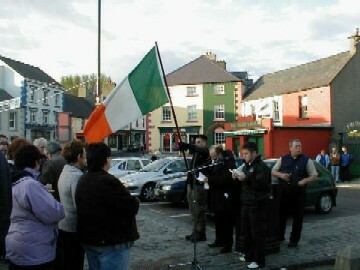 ON May 6 last Republican Sinn Féin organised rallies in Dublin and Galway in memory of the 25th anniversary of the death of Bobby Sands on May 5, 2006. "On the 25th anniversary of the death of Bobby Sands on Hunger Strike we remember how past attempts to criminalise Republican POWs met with resistance both inside and outside England's prison camps. From 1976-1981 we witnessed blanket protests, no-wash/dirty protests and finally two hunger strikes - the latter culminating in the deaths of ten men in the H-Blocks of Long Kesh. "And yet former Republicans persisted in signing away political status at the behest of the English government under the terms of the 1998 Stormont Agreement. But these servants of English rule should be reminded that political status - won through enormous sacrifice - was not theirs to sign away. It remains the right of Republican POWs in 2006 as it did in 1976. "Today Republican POWs are forced to endure up to 23 hours lockup and limited association. Controlled movement means that only three prisoners are permitted on to the landing at any one time, and they are subjected to excessive rub-down searches and even degrading strip-searching - a practice which the Brit prison authorities in the Six Occupied Counties refuse to acknowledge. Prisoners are first stripped of their upper garments, followed by their lower garments. "A recent review of the segregated regime in Maghaberry proposed that rub-down searches continue but with a slightly reduced intensity - but it does not seek to eliminate or reduce strip-searches. "Visitors have their details recorded and stored on the prison computer system and are subjected to the sniffer dog which can be manipulated to prevent open visits. Prisoners themselves are made to pass the sniffer dog when returning from court hearings and temporary release - and sent to the 'boards' if they 'fail' the dog test. The abuse of drugs has never been associated with Republican POWs and this treatment is nothing short of punitive. "The Republican Prisoners' Action Group has held pickets, protests and public meetings to raise the awareness of the conditions in Maghaberry - which Msgr. Faul described as 'inhumane' after meeting with us. We have also had positive meetings with groups such as the Six-County Human Rights Commission and have made arrangements to meet with other interested parties. In addition to this, we have been involved in leafleting and informing the media in order to raise the profile of prisoners' issues. "The RPAG calls on everyone to support the just demands of the POWs for full political status. Twenty-five years after the death of Vol. Bobby Sands, TD on hunger strike the Republican POWs have maintained continuity with the fights against criminalisation and reasserted the legitimacy of opposing English rule in Ireland through force of arms." The main oration was delivered by Des Dalton, Vice President, Republican Sinn Féin. In Galway the parade assembled at the Cathedral and over a hundred people marched to the Liam Mellows Monument in Eyre Square, where several hundred people were waiting. Crowds also lined the parade route. Joe O'Neill, National Treasurer, RSF, gave a very stirring address and Cathaoirleach Tomás Ó Curraoin also addressed the crowd. We love to talk - action what action? Apart from not ever having done anything, although expousing to support armed struggle, haven't even killed one Brit or Peeler, Bombing campaign (or Hoax campaign) riddled with touts, all there good people in prison - with all this on your conscience its easy to see why RSF ae such a bitter twisted bunch of gutter snipes who thrive on negativeity and instead of seeing the true enemy as Brit Securocats, try miserably to attack SF all the time (o yeah i forgot Sf are Brits;) RSF wise up - do something - provide a viable alternative, be positive, take action and instead of attacking young activists in Ógra, present your analysis - if you have one, on the table - but lets not get in to this petty shite - you may disagree with SF strategy - but your not going to get recruits out of criticising it - you'll do that through some solid productive work! PS - Des dalton was in Ógra Fianna Fail, pehaps Des is a career politician gone wrong, he can never criticise ÓSF! RSF is riddled with touts? have you had a look at your leadership! lol donaldson, scap, nellis the list goes on, then put into your little mind that your party is PAID for by england! are you kidding me? as for credible alternatives read Eire Nua and Saol Nua, revolutionary REPUBLICAN politics, but given that you support a mainstream constutional nationalist party that is financed by the brits and the US to maintain the staus quo it wont be YOUR kinda thing. Republicanism isnt always about guns but its always about revolution. In reply to the 'Bebo'-type post ! Political action , of course ! Monthly newspaper , regular pickets , protests , commemorations etc . RSF are a political organisation - not a military organisation ! When was the last time (P) SF "killed a Brit" or ran a bombing campaign ? Like Denis and Scap , you mean ? Put there by the likes of those that put PIRA men and women away . And no 'Queens Shilling' or Free State cash to ease my poor conscience ! Are those the same "securocrats" [NOT 'cats' , man !!] that the PSF leadership are pleading with to re-introduce Stormont ? They will never be properly regarded as such , not even by Westminster . Said institution will allow PSF into the 'porch' , but not the 'parlour' ! Useful 'natives' , don't-you-know . The "young OSF activists" that have posted on this thread have shown themselves to be remarkably ill-informed , politically speaking , and that fact should be exposed - if only in the hope that to do so will encourage them to learn about an issue before attempting to post on that issue . Details , in full , on the RSF website . To highlight the fact that posters representing a political organisation are ill-informed re their chosen field is not "petty sh**e" - rather , that description fits better that which those posters put on this thread . With PSF strategy , yes . Did PSF not criticise the Sticks (before they turned into them) ? Do they not still do so ? 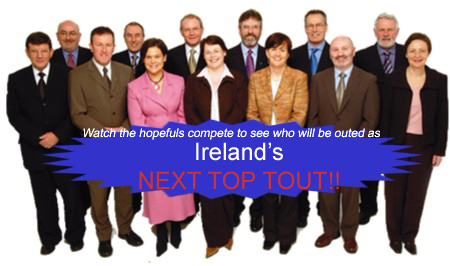 And Fianna Fail etc , too ? Did he stay with them once he realised they were only a political 'sponge' for the parent organisation ? "And yet former Republicans persisted in signing away political status at the behest of the English government under the terms of the 1998 Stormont Agreement. But these servants of English rule should be reminded that political status - won through enormous sacrifice - was not theirs to sign away/"
This year, the 25th anniversary of the hunger strikes for political status in which ten young men died, and there are over 100 men in gaol, north and south, provo members/supporters, in partcular, their young enthusiastic, yet mislead and misinformed members should really think about that above qoute. Really think. Try to justify the behaviour of the kind of people you so foolishly follow. It was earlier mentioned by a poster that the provos don't like truth and history, and well they shouldn't. young people knowing the truth and their history is a real threat to them and the comfortable postion awarded to those who betray and sell all principles and integrity for a measly cheque or two. The provisionals are a disgrace, plain and simple. It seems to me that the comments from people trying to portray themselves as RSF members are imposers. The British Government, British Military Intelligence and PSNI Special Branch have special units set up to post comments on websites like this. Their overall stratagy is to discourage the vast amount of Irish people who are becoming politically aware of their right to self-determination. Sinn Féin is the strongest party in Ireland that is actively building a 32 county socialist republic of Ireland. 'Realist' blames the messengers ! Translation : 'I am unable to refute your arguments , therefore I will attempt to refute the source' . You would know that better than most of us , of course . You and your people not only 'deal' with those three bodies on a regular basis , but are actually paid a salary to do so . RSF want proper self-determination : for us , it is not a case of saying to Westminster - 'Stay if you want , just treat us better' . How so ? By agreeing to implement Westminsters 'jurisdiction' over part of this isle ? on account of the huge number of comments not in accordance with editorial guidelines - consisting mostly of bulletin board chat, and being also duplicates of comments made on two other hunger strike commemoration articles at http://www.indymedia.ie/article/75867 and http://www.indymedia.ie/article/76000 , none of which add any new information to the story.